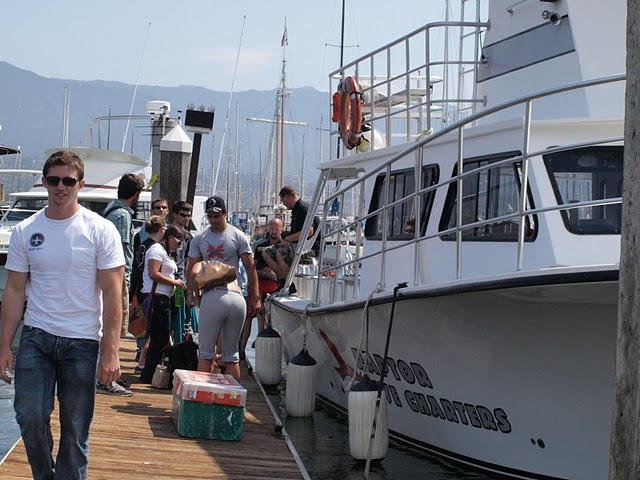 On July 6th at 6:00 am, the Oceans group departed Irvine for a two-day research trip. The first day was to be a four-hour research cruise to sample the kelp forests and oil seeps off of Santa Barbara and Isla Vista, CA aboard the dive boat Raptor. 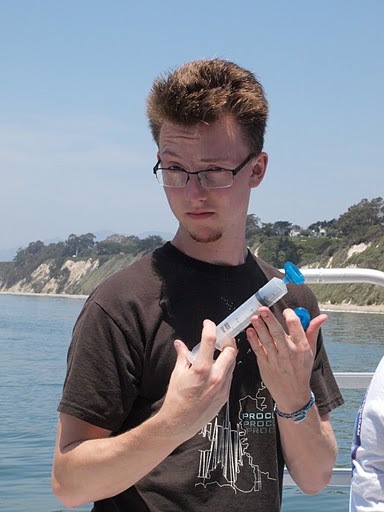 The second day included a morning talk by Kyle Cavanaugh at UC-Santa Barbara followed by sampling at the Andree Clark Bird Refuge near Montecito. The three-hour drive to Santa Barbara began with eager chattiness and lots of questions from the students. Slowly, the early hour crept up and one-by-one each student succumbed to some awkward derivative of sleep. The last hour of the ride was silent except for my occasional giggle at the sight of ten unconscious students slumped over themselves like comatose contortionists. We eventually arrived at the Santa Barbara Harbor and waited for the boat and Professor Raphe Kudela. The students spent the time to unravel from their pretzel shapes and to tour the harbor. At least two students declared they were moving to Santa Barbara. Students load the R/V Raptor. At 11:00 am we loaded the boat and were briefed by Captain Joe Cochran and Professor Kudela. We set out of the harbor for our first station and no more than a mile offshore we were met by a pod of Pacific White-sided Dolphins dashing through the bow-wake. The sun was shining, the seas were flat; this was going to be a good day. How do kelp forests act as “heat islands” of the coastal ocean? Can oil and methane emissions be detected and quantified using hyperspectral imagery? Can ship wakes in imagery be used to estimate size, speed, and draught of a vessel? Can an optical signature be developed to identify the toxic cyanobacterium Microcystis? 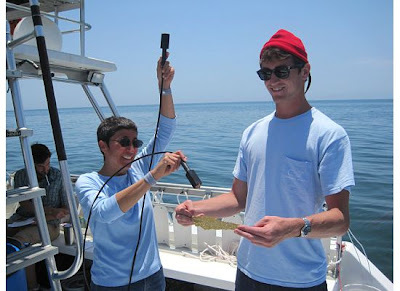 How does phytoplankton biomass vary in the Santa Barbara Channel between an El Nino year (2010) and an El Nino-neutral year (2011)? Does day-to-day error exceed inter-annual error in estimates of kelp biomass from imagery? What implication does this have for interpretation? 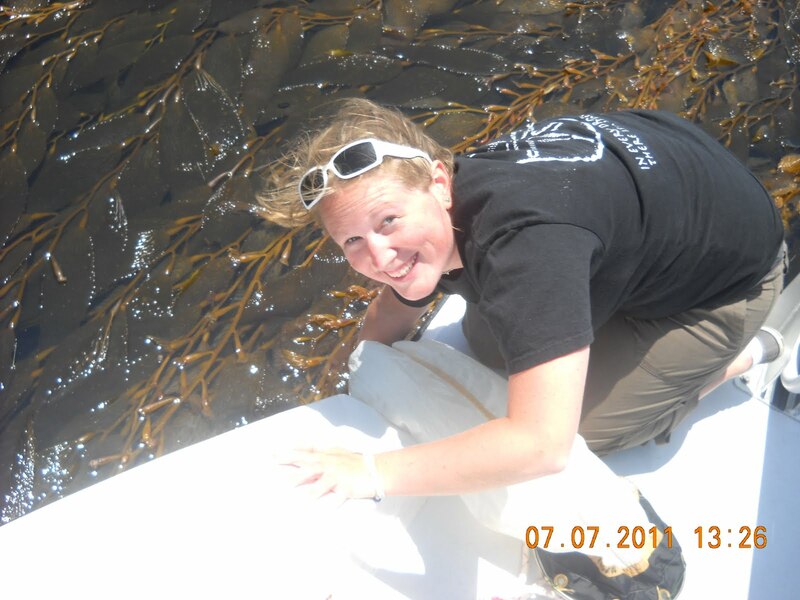 Amelia Snow prepares to collect a plankton tow among the kelp fronds atIsla Vista, CA. At the first station, Arroyo Burro State Beach,Raphe and I discussed kelp forest ecology with the students. We demonstratedthe methods for each sample measurement and walked through the order ofoperations while collecting data. 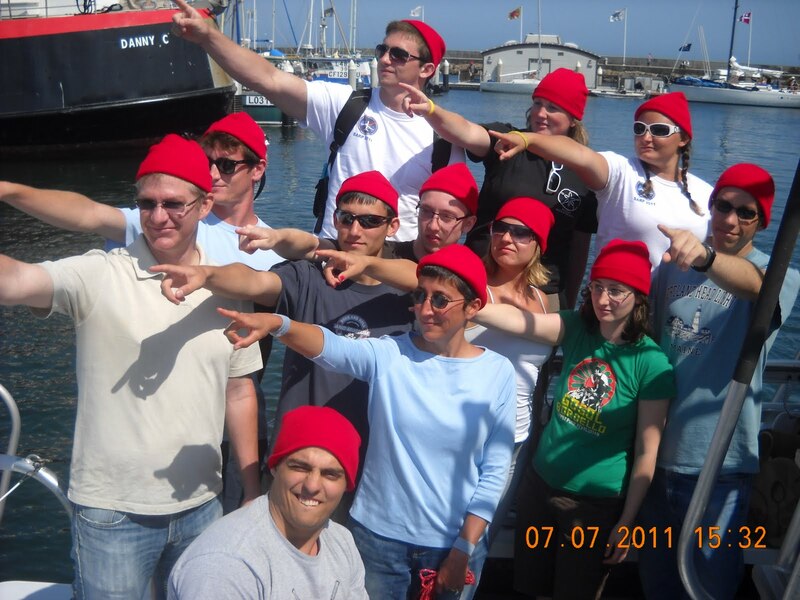 We also administered the SARP-Oceans rite ofpassage… The eating of the kelp. 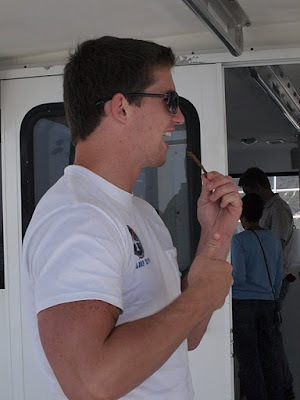 Almost all of the students tasted the bryozoanencrusted kelp. Most reporting that it was, “slimy, sweet, and tasted of thesea.” One student reported numbness of the tongue, but she revived soon after. After Arroyo Burro, we motored over to our primary sample site—the Isla Vista kelp bed. This is a large, dense kelp bed just offshore of UC- Santa Barbara. We collected data along a transect: just offshore of the kelp bed, through the kelp bed, to the inside edge of the bed (near the surf zone) and then returned through the kelp offshore. All samples were collected, including some air samples for Don Blake’s group. The students took charge of the sample protocol and Raphe and were reduced to spectators. 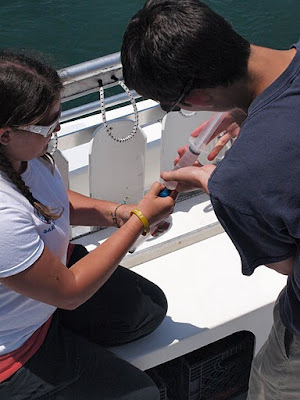 It was a lot of fun watching Zhanna take charge of the logistics; while Runyon and Michael collected water temperature and salinity; David, Julia, and Jimmy collected light reflectance spectra; Amelia, Kaitlin, and Noah collected phytoplankton and CDOM samples; and Nick carefully recorded the data. Zhanna ran a tight ship for the remainder of the stations that day. At the end of four hours, we motored back to Santa Barbara very pleased with the samples we collected. There was only one casualty of the day—the spectroradiometer stopped communicating at the second to last station. Oceans team celebrates the end of the cruise! The following morning we visited UC- Santa Barbara for a talk and discussion with Kyle Cavanaugh. Kyle’s work on imaging kelp forests inspired the curriculum for the course. He gave a comprehensive overview of remote sensing research and helped some students further refine their research questions. We toured the campus after the talk. One more student declared he was moving to Santa Barbara. After the tour, the students were confronted with the reality of field sampling… the spectroradiometer was communicating again, but now it needed an external power supply in order to sample the bird refuge. We needed those samples for David and Julia so they could work on an optical signature for Microcystis—a toxic cyanobacterium implicated in human and animal deaths. Faced with the technical challenge, the students huddled together and decided on a plan. We dispatched to the local hardware store and two competing teams raced into the store, grabbed carts, and ran down the aisles to collect supplies. The teams eventually joined forces and found the equipment, we checked out and tested the equipment… success! Off to the Andree Clark Bird refuge we drove to collect reflectance spectra and CDOM samples. Finally, our field trip drew to a close and we returned to Irvine to process the samples and use them to help answer the students’ research questions. All in all.. a great trip!